Rail education at Michigan Tech includes integrated coursework, field trips, research projects, internships, scholarships, and hands-on opportunities. In addition to serving Michigan Tech and other college students, the Rail Transportation Program (RTP) also values pre-university education, providing opportunities and programming to help prepare you for a rail industry career. 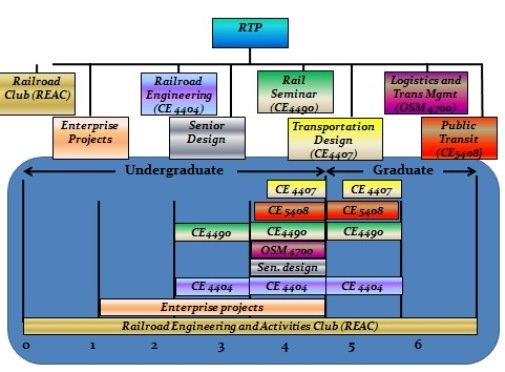 RTP courses, Railroad Engineering and Activities Club (REAC), Senior Design, and Enterprise Projects, are part of the Rail Education Roadmap. Below you will see the points in your academic career where you can participate in courses and activities whether you are an undergraduate or a graduate student. We encourage all Tech students to get involved with REAC as soon as they arrive. Click Here to find out more about Rail Industry Scholarships!